Kendall Ryan won the final stage of the Women's Colorado Classic while Katie Hall secured the overall win. Following an incredibly aggressive final day of racing, Kendall Ryan ( Tibco-Silicon Valley Bank) won the sprint finish on stage 4 ahead of Emma White (Rally Cycling) and Allison Beveridge (Rally Cycling). 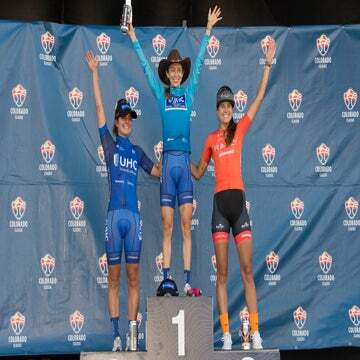 UnitedHealthcare’s Katie Hall came away with the 2018 Colorado Classic overall race victory, adding to her remarkable streak of U.S. stage race wins. Hall’s teammate Leah Thomas finished second in the overall race, clinching the queen of the mountain victory, making for a banner finale for UHC, whose cyclists have won every stage race they’ve entered this year, but which will be disbanding after 2018. The final stage of the 2018 Colorado Classic women’s race featured a circuit around downtown Denver on a 9.1-mile course that started and finished at the Velorama Festival. It sent racers around Coors Field, through North Capitol Hill and Uptown to City Park and back. The women completed four laps for 34.8 miles. The stage saw plenty of attacks as well as its fair share of handlebar scraping and high-speed jostling. A number of women, including stage 3 winner Jennifer Valente, fought for the stage win, but Ryan proved the fastest and was able to cross the finish line first.